Carpal tunnel syndrome assessment. 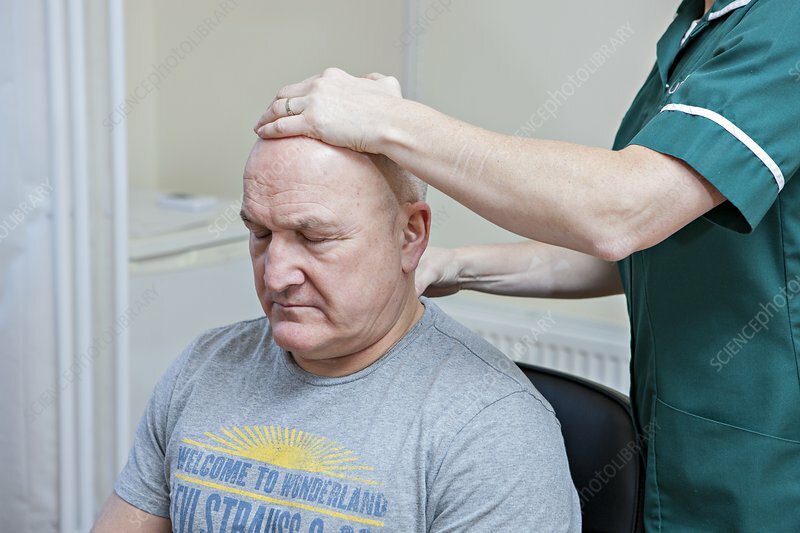 Paramedic assessing the neck of a patient with symptoms of carpal tunnel syndrome (CTS). Some disorders of the hands, wrists and arms can cause related problems in the neck and shoulders due to the interplay of muscles and nerves. This assessment is being done during a consultation at a general practice (GP) clinic. Carpal tunnel syndrome is caused by the median nerve from the arm being trapped by bones and ligaments in the wrist. It can cause pain and numbness in the fingers, and can affect hand and wrist function. In severe cases, the ligament trapping the nerve may be surgically cut to treat the condition. Photographed in Edinburgh, Scotland.